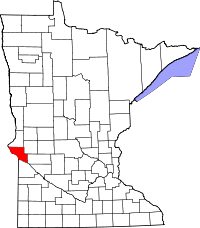 One of the smallest counties in Minnesota as far as population, Big Stone County stores the county records at the Court Recorder office in Ortonville, MN. The office has property records that stretch from the 1870s to the present, military discharge records that begin with World War I veterans till today, and birth, death, and marriage records which begin around 1880 and continue to the present. The office allows genealogists and researchers access to all available public records, and provides the required forms to obtain birth and death certificates. In addition to the Court Recorder's office, the USGenWeb Project has a Big Stone County page which provides links to a large number of genealogy resouces, such as archives, cemetery records, local histories, and more. Big Stone County is named for the nearby Big Stone Lake, which is only one of the approximately 30 named lakes in the county.